NEW YORK (CelebrityAccess MediaWire) — If you were hoping to go to this year's Billboard Touring Conference & Awards and you don't have your ticket yet, you might be out of luck as the event has officially sold out. Set for November 13 & 14 at the Roosevelt Hotel in New York City, the event will be keynoted with a Q&A session by Roger Waters, fresh from his recent tour The Wall Live. Other presenters at this year's conference read like a who's who of the modern music business and include Michael Rapino, Rob Light, Marc Geiger, Tom Windish, Marsha Vlasic, Mitch Rose, Coran Capshaw, Tim Leiweke, Jim Glancy, Ashley Capps, Marcie Allen and numerous others. 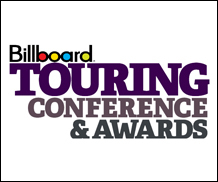 The conference also includes the Billboard Touring Awards, hosted by Gary Dell'Abate, a.k.a. "Baba Booey” and 10th Anniversary Billboard Touring Conference Concert with performances by Florida Georgia Line with Dallas Smith and Chris Lane.